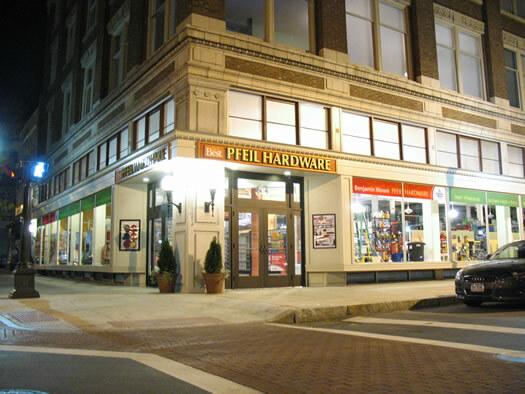 We were in downtown Troy last night and the Pfeil Hardware store caught our eye. The store, which is in the Conservatory Building at 3rd and State, opened in September. And it's beautiful. Really (here's an interior pic from the TU). Its shelving, high ceilings and big street-level windows make it look like a bookstore -- except the window displays are for ladders and trash cans. The way the structure of the space seems to drawn the sidewalk in is a refreshing alternative to the massive, closed, fluorescent-lit boxes like Home Depot. You know how it's supposed to be when you die and go to heaven? You walk through the pearly gates and everything you ever dreamed of is right there for you, shining and sparkling. That's sort of what it was like for Brenda and I when we walked into Pfeil Hardware for the first time this morning. That looks wonderful. I wish more businesses (especially in urban areas) would realize that the aesthetic appeal of their building draws in customers and increases sales. I've never wanted to buy hardware as much as I do now. I never really have the desire to buy hardware.....I'm also glad to see Troy was not long without a hardware store. Beautiful photograph, I was pleasantly surprised to see it was Troy! Haven't walked over for a look yet, but something doesn't quite add-up here, at least not in my tiny mind. I know the Pfeils own the building, and that the primary business is the apartments above. I also see that they're a Do-It-Best Hardware affiliate, which is like being IGA-affiliated if you're an independent grocer: the upstream org provides the procurement and logistics power. This is third-way retailing, where you're "independent" (part of a "co-op"), not a franchisee nor a company store. There are other affiliates nearby. Think one recently folded in Watervliet. Yet I don't see the market for a hardware storefront there -- not one that's viable taken alone, anyhow. There ain't enough folks walking around that block what needs 'em some molly-bolts, pronto. And you're not gonna drive there. Maybe I don't appreciate the terms of a Do-It-Best affiliation. There's a story here. Seems clear that the Pfeils' play is longer-range. What's less clear is if it's straight-up community investment by well-off folks (which is generally admirable), or a gentry acceleration play where you hope to Park-Slope downtown Troy within, say, six years -- and you conveniently own nearby real estate (which is cynical, IMO). Bears watching. Maybe it's all good. Wealth doesn't always press its advantage.